When illness comes into the life of a pet, it’s a troublesome and worried time for the loving owners. Parents may try to shield their kids from the knowledge that their beloved pet is ill, but children need to be included in what’s happening to their friend. It’s hard for a child to feel something is amiss but be unable to open a conversation about it with well meaning parents who are concerned for the child’s emotional state, so give your child the option to be a part of vet visits. Some kids will want nothing to do with the process while others will be infinitely grateful to participate in the healing of a sick pet. Phone the vet’s office first, let them know your child wants to accompany you and see what kind of books and toys are available for kids to play with or if you should bring something with you. Ask if many kids come into the office and determine if they are experienced at dealing with children. If not, talk to them about how your child wants to be involved and that you’d like the vet to explain what’s happening to their pet in a way they can understand, have your child ask the vet questions and be able to participate in the exam. If your vet seems at all unwilling or reluctant, be cautious about bringing your child in. Most vets are aware of the psychological benefits to children by being a part of the process and should be helpful and understanding to your needs, however. Vet offices that are smaller, where the staff know you and your pet, are the best places to bring children. Kids of all ages are reassured when the vets and staff can greet their pet by name, clearly show caring and affection for the animal, and are willing to spend time interacting kindly with pets and answering any questions kids might have. Larger pet hospitals that are constantly dealing with life and death situations in a busy environment may not be able to take the same amount of care and consideration with the needs and questions of children, so your child may be a little disturbed by the businesslike environment. If you need to take your pet from your regular vet’s office to the animal hospital, talk to kids about what may be different here and give them the choice to go home before heading to the hospital. Let children give information to the vet and staff about their pet’s illness, this helps them come to terms with it and feel like they are helping their pet to get better. Children 7 and below are more relaxed with being at the vets, enjoying visits with other animals at the office and not usually as aware about what’s happening with their pet. Kids that are 8-15 years old are far more anxious about their pet’s condition, they need to be kept informed of what’s happening and become more nervous the longer they need to wait without information, so having staff and vets keep them in the loop is important. 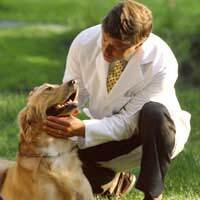 Also, allow your kids to collect the ‘report card’ of your pet’s condition when the visit is done. You will, (of course) have to collect the bill! Be aware that vaccinations and needles bring fear and anxiety to most children. During this part of the exam, parents may want to distract their kids or cover their eyes during any actions involving needles, telling them that it’s hard for you to watch as well but it’s part of the process of determining pet illness and healing animals. Explain that needles actually don’t hurt very much at all but only look scary. You may need to take your child from the room at this point and return when the needle is done. In cases where the diagnosis is not good and there’s a chance of your child’s pet passing away, children need to be able to touch their pet one last time before giving them over to vet care. Let your child tell their pet it will be okay and they love them. If they feel shy about this, take the initiative and tell the animal this yourself. Kids often feel guilty if their animal passes on without getting a chance to say goodbye so take the time to avert this guilt from happening. A common feeling among kids is a feeling of responsibility for a pet’s illness, so talk to them about why this is not so.